Offensive coordinator Patrick Boies and defensive coordinator Ronald Hilaire – both full-time employees at the University – will lead the McGill Redmen football team as "co-coaches" effective immediately, in light of the recent resignation of head coach Clint Uttley. 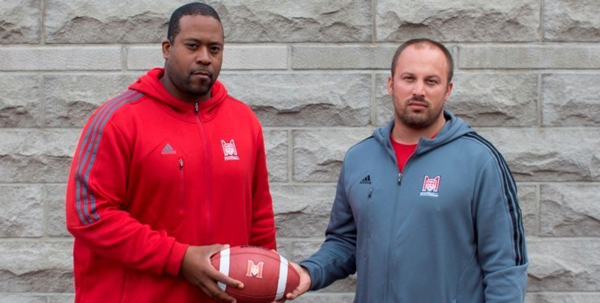 Offensive coordinator Patrick Boies and defensive coordinator Ronald Hilaire – both full-time employees at the University – will lead the McGill Redmen football team as “co-coaches” effective immediately, in light of the recent resignation of head coach Clint Uttley. Boies, a 38-year-old native of Ste, Foy, Que., was appointed offensive coordinator of the team in January, 2012 and the title of assistant head coach was added earlier this year. Prior to joining the Redmen staff, he coached for eight seasons at Collège Garneau, including six years at the helm. In 2011, he guided the Élans to a Bol d’Or Division 1 championship. He also led Garneau to a Bol d’Or collegiate AAA title in 2008. Boies was head coach of Team Quebec at the 2014 Canada Cup and served as offensive coordinator for Team Canada, winning the global championship in 2012 in Austin Texas. In 2013, he coordinated the offence for Team Quebec, winning the Canada Cup national title in Moncton, N.B. Boies previously was defensive coordinator at Collège Beauce-Appalaches in 2002 and directed the Cannes Iron Masks to the professional Div. 2 championship in France. During his playing days, he was an all-Canadian defensive back and helped Laval win their first Vanier Cup national title in 1999. Hilaire, 30, who hails from Laval, Que., was appointed defensive line coach at McGill in February, 2014 and added defensive coordinator duties after serving in a similar capacity for three years with the Montréal Carabins, where he was also the recruiting coordinator. He has coached with Team Quebec since 2012 and is currently a co defensive coordinator and D-line coach for the Canadian U-18 squad. Prior to working with the Carabins, he was a defensive line coach at College du Vieux Montreal in 2010 and 2011. He also worked with the Canadian under-18 team as D-line coach and was the defensive coordinator of Team Quebec for the 2014 Canada Cup. A fourth-round pick (27th overall) by the Calgary Stampeders in the 2008 Canadian Football League draft, Hilaire previously played as a defensive lineman at the University of Buffalo and at Collège du Vieux-Montréal, where he won three Bol d’Or championships.